Our body is a very intricate system which is capable of sustaining itself through a huge array of corrective and remedial control mechanism. It is hard to live totally healthy life in today’s era of pollution and infections, but still, our body manages to live through all the adverse conditions by equipping our immunity. But despite caring enough for the body, we might face troubles if our body’s control mechanism doesn’t work properly. For example, if our immune system doesn’t work properly. If the immune system doesn’t eliminate pathogens, it may lead to a big infection. On the other hand, if the immune system goes haywire and starts attacking our body’s healthy cells, it may lead to many other complications such as Auto-Immune Diseases. Ayurveda and Naturopathy Treatments can help one in getting the systems back on track with the help of nature. One of our guests at Nimba Nature Cure Village was looking for the natural remedy for watery blisters on the skin in the neck, hands, upper back, lower back, sides of the chest, and thigh region. The blisters were itchy and they got aggravated upon exposure to sunlight. For more than four years, this condition severely restricted the 55 years old guest’s movement in the sunlight and it also restricted the food intake because the condition worsened after eating foods like milk & milk products, cashew nuts, yeast, wheat, oat, soy beans, and chick peas. The team of experts at Nimba Nature Cure Village thoroughly examined her health condition and created a comprehensive treatment plan for her. 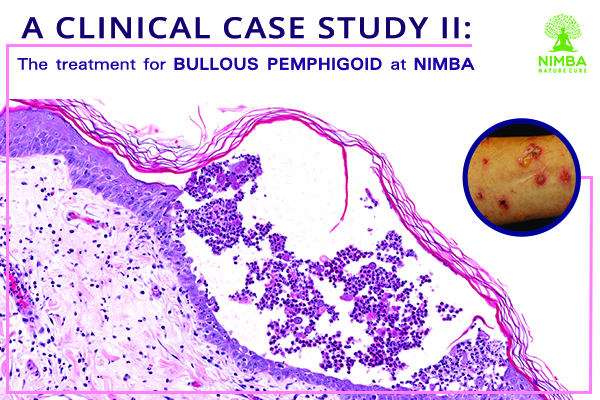 Here is our Clinical Case Study on Alternative Medicine for Bullous Pemphigoid. Bullous Pemphigoid is an Auto-Immune Disease with symptoms of hypersensitivity reaction. The exact cause of hypersensitivity can differ from person to person and it is most of the time unknown. Bullous Pemphigoid had resulted in blisters or bullae predominantly between the epidermis and the dermis layer of the skin, at multiple locations. The guest was suffering from the Urticarial form of Bullous Pemphigoid with episodes of anxiety and stress associated with it. Upon her thorough check-up, the team observed tense bullae (blisters) on both extensor aspect of lower arm, lateral aspect of Lower back, medial aspect of bilateral thighs, and lateral aspect of trunk. Nikolsky’s Sign which is used to differentiate between the types of Pemphigus, was negative which confirmed the case to be of Bullous Pemphigoid. Our team studied the patients through visual examination as well as medical tests such as Allergic Hypersensitivity Test, Histopathologic Analysis, and Immunofluorescence studies. Apart from that, most of her vital parameters seemed normal, ruling out the presence of other diseases. The tests and the previous medications established Bullous Pemphigoid as the main problem. It is a chronic disease with blisters in sub epidermis and severe inflammation. Sometimes it goes on for months and even years with frequent incidents of relapse and remissions. The persistent Urticarial lesions, which may subsequently convert to bullous eruptions or may not, clinically confirmed Bullous Pemphigoid. Diagnostic tests such as direct Immunofluorescence test indicated a linear band of immunoglobulin G deposit along the dermo-epidermal junction. And the Indirect Immunofluorescence test showed immunoglobulin G class circulating autoantibodies that bind to the epidermal (roof) side of the skin basement membrane. The guest was already on Medication; Anti Histamine & Lacto Bacillus treatment, and Vitamin B Complex & Calcium Supplements. The guest was admitted for alternative medicine for Bullous Pemphigoid at Nimba Nature Cure Centre in August 2017. The guest was suggested to go for a 16 days alternative medicine treatment combining Naturopathy, Ayurveda & Panchakarma, Detoxification, and Yoga & Meditation; to get relief from the existing health condition. Starting from 31st August to 15th September, she was given Naturopathy treatments for Bullous Pemphigoid such as Herbal Wrap, Mud Therapy, Hydrotherapy, and Reflexology on a regular basis. She was also given Ayurveda & Panchakarma therapies for Bullous Pemphigoid like Shirodhara, Sarvanga Lepam, and Marma Massage. Also, Nutrition and Diet therapies were implemented to help the body regain immunity back on track. Treatments like Alkaline Diet, Herbal Nutritional Juice, Antioxidant Therapy, and Liver Detoxification Juice therapy were given to the Guest. To address the issue of episodes of anxiety and stress, our team of experts chalked out a comprehensive schedule for Yoga, Meditation, and Energy Healing. During the period of treatment, mild aggravation of blisters was noticed in the first week, with 4 to 5 new blisters of small in size. But soon, the number of blisters was reduced and almost all of them healed to a great extent. No new Urticarial rashes were observed during the entire treatment. Through the 16 days of Alternative Medical System Treatments, the Urticarial Bullous Pemphigoid was controlled and the guest felt psychologically confident and healthier. With Nimba’s Yoga & Meditation and Energy Healing treatments, the patient achieved relief from the stress and anxiety related to her health. With the help of Naturopathy and Panchkarma treatment at Nimba, the formation of IgG autoantibodies targeting Bullous Pemphigoid Antigens Dystonin, responsible for the Auto-Immune Reaction, was effectively controlled. With Nutritional Diet Therapy and Natural Detox Therapies, the harmful toxins and allergens from food and other external sources triggering antibody reaction were eliminated from the body, to stabilize the body systems. Life-style modification was suggested to the guest for a lifelong care through Alternative System of Medicine and a healthy everyday life. The guest’s immune system was attacking its own healthy cells as an allergic reaction to certain allergens from the food as well as the environment. It had led to Urticarial Bullous Pemphigoid which is not so common disease in the world. Also, due to persistent pain and itching, the guest had developed stress and anxiety problems which made her condition worse. With the help of Alternative Medicine System Treatments, the hypersensitivity was reduced to a great extent and with the psychological support in the form of Yoga, Meditation, and Energy Healing, the guest was empowered to eliminate the disease completely from the body.